The Bannerville Church of the Brethren began as a Sunday School in 1879. It was founded by Maggie Shellenberger who operated a general store and post office in Bannerville with her husband Enoch. The Church meeting house was later built and dedicated in January 1892 as the German Baptist Brethren Church. Preaching was introduced in 1881 with ministers from the Maitland Brethren Church visiting Bannerville every eight weeks. These included Edward M. Howe, Jacob H. Richard, Saumuel J. Steinberger, and Joseph H. Fleming. During this time of limited ministry, three couples were credited with keeping the congregation going - Henry and Mary Peters, William and Lizzie Wagner, and John and Mary Shellenberger. In 1923 Reverand Fleming became the first full-time minister of the Church. The Bannerville Church of the Brethren was granted independent status (from the Maitland Church) in 1955. In 1964 the congregation entered into joint pastoral relations with the Lewistown charge. And in 1980 the congregation became once again independent. The Church property has expanded over the years with a basement excavated in 1945, the main entrance enlarged in 1949, and an annex adding three Sunday School classrooms in 1954. The baptistry was built around 1958. In 1987 Trustees purchased the lot across the street for parking, and in 2015 we purchased an adjoining lot next to the Church. 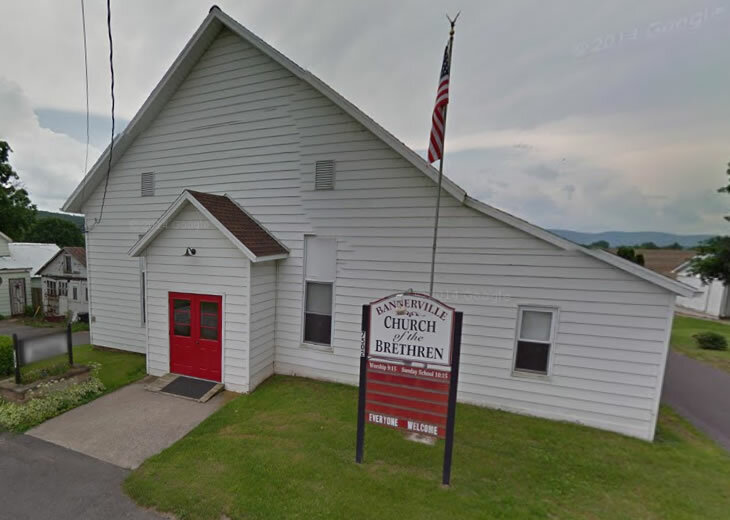 History of the Church of the Brethren Pennsylvania Middle District.